The Terma Quadrus Bold ONE provides statement heating for bathrooms or en-suites, with its daring design and imposing metallic black finish. Featuring an in-built, push-button interface, the Quadrus can be controlled with a few simple touches - offering independent bathroom heating and towel drying, alongside a 2-hour timer function. Download or view the Quadrus Bold 600 x 870mm assembly instructions & technical drawing here. Download or view the Quadrus Bold 450 x 1185mm assembly instructions & technical drawing here. Download or view the Quadrus Bold 600 x 1185mm assembly instructions & technical drawing here. Quadrus Bold towel rails are rated IPX5 and must be professionally installed by a qualified electrician in a suitable bathroom location. Always defer to the manufacturer’s guidelines about the bathroom suitability of any product. For further installation information, please see the Quadrus Bold manuals and product dimensions. 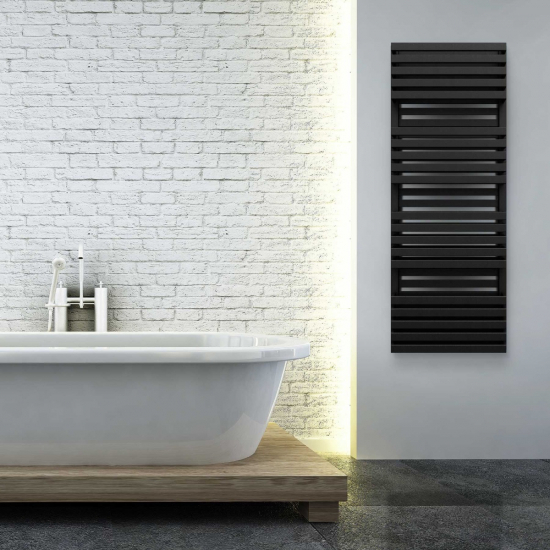 Terma Quadrus Bold ONE Designer Electric Towel Rails provide statement heating for bathrooms and kitchens, with their imposing black finish, staggered rectangular bars, and modern design. For bespoke, stylish bathroom heating, the Quadrus Bold is second to none.